We use techniques from (tracial noncommutative) polynomial optimization to formulate hierarchies of semidefinite programming lower bounds on matrix factorization ranks. In particular, we consider the nonnegative rank, the completely positive rank, and their symmetric analogues: the positive semidefinite rank and the completely positive semidefinite rank. We study the convergence properties of our hierarchies, compare them extensively to known lower bounds, and provide some (numerical) examples. Gribling, S.J, de Laat, D, & Laurent, M. (2017). 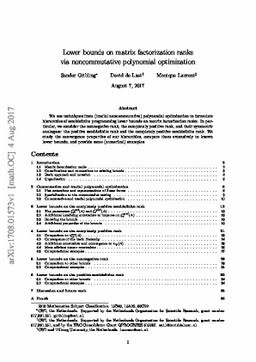 Lower bounds on matrix factorization ranks via noncommutative polynomial optimization.